I'm mildly embarrassed to admit it, but my favorite scene in all of film is probably the closing scene from The Empire Strikes Back. ESB is probably also my favorite movie. I understand and acknowledge that it isn't the best movie there is by whatever silly standards there may be of measuring these things, but it is my favorite. Anyway, the last scene is beautiful. If you haven't seen the movie, please don't let me spoil it for you; get up right now and get a copy and watch it, because you need to see it. You continue reading without having seen at your own risk. But seriously, ESB is 28 years old (28 years old!! ); it's not like you have an excuse for not having seen it. 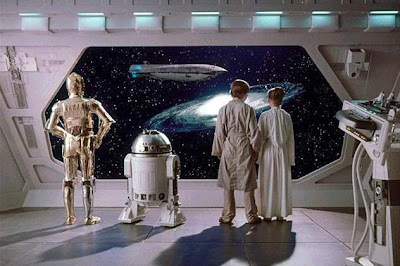 So, at the end of the movie, Luke Skywalker, Princess Leia, and the droids are on an observation deck on a Rebel Alliance ship floating along with the rest of the fleet in space, because the rebels don't have a headquarters anymore. Lando and Chewie are out on the Millennium Falcon, getting ready to take off to look for Han Solo, who's just been frozen in carbonite and handed off to Boba Fett for delivery to Jabba the Hutt. Luke's getting an artificial hand installed by a surgical droid, and he and Leia are talking with Lando and Chewie over the radio, exchanging encouraging words about finding Han and getting him back. The Falcon undocks from the capital ship and goes into hyperspace while Luke and Leia watch through the viewport. The end. Except not. What makes this such a great scene is that it really has to be seen to be appreciated; Irvin Kershner has here directed a scene that plays on the emotions in ways that any other medium wouldn't be able to do. Have a look. Do you need a tissue? Honestly, maybe you should watch the carbon freeze scene first and then go back and watch the last scene. Now you need that tissue, huh? Or maybe not. You might have spent your childhood bathing in ice, and you could now be numb to the world, I suppose. For the rest of us, that ending sequence is really great. I think. I honestly used to believe it was just me, because you know, the people I know don't usually go around proclaiming that their favorite scene from a movie is the last scene from Empire Strikes Back. It just doesn't get much play in conversations; it's overshadowed, I guess, by the revelation that Darth Vader is Luke's father. But a few months ago I was turned on to Spaced when I read somewhere that the series was coming out on DVD in America. Spaced is a Britcom directed by Edgar Wright and written by and starring Simon Pegg (both of Shaun of the Dead fame) and Jessica Hynes (AKA Stephenson), who also had a cameo in Shaun. The series is actually a lot like Scott Pilgrim in that it centers on two slacker-type twenty-somethings. Ordinary twenty-somethings, in other words. It's also like SP because it constantly deploys pop culture references; unlike something like Clerks, which is where people had to turn for their Star Wars references back when I was a kid, Spaced boldly incorporates some references into the plot in bizarre ways. In one episode, for instance, Simon Pegg's character stays up all night playing Resident Evil 2 while hopped up on speed; the next day he experiences zombie-related hallucinations and "rescues" his roommate, neighbor, and landlady from a performance art after-party that's going downhill awfully quickly. Well, in the next-to-last episode of the entire series, things are in disarray. Wait, stop. You really shouldn't read the next paragraph down or follow the link in it if you haven't seen Spaced. Go get a copy, Netflix it, something. But if you think you may not see the series at all, I guess you can keep reading. Maybe this will convince you that you are wrong and you must see it. Sigh. Anyway, there's a dinner out that goes horribly awry, and Simon and Jessica's landlady is convinced that Simon is cheating on Jessica with another woman. He is in fact dating this other woman, but his relationship with Jessica has all along been a pretense, a means of securing a lease and nothing else. The landlady learns all of this, and she is furious and storms off. Things look grim, but the friends are determined to make one last try at appeasing her. And that's where this scene comes in. Yes! They referenced the ESB ending! This was the point at which I realized, finally, that I wasn't the only one! Other people love this scene too! This was quite a satisfying discovery for me. See, the reason I'm so fond of ESB is that it is a movie that works as part of a trilogy like no other movie I've seen. Yes, yes, it's the second act, so it's all dark and everything, but I honestly don't think I've seen many movie sequels that have done what ESB does so successfully. It deepens the mythology; it provides context that shades in the characters we care about so much from the first movie. One thing I feel like really successful fiction has to do to be enjoyable is that it has to fabricate a world that's credible. I don't just mean something like Lord of the Rings, which has to build an entire universe from the ground up, but really I'm talking about any fiction. The reader has to believe that there is a world in which these characters are operating and in which their actions make sense. So when we learn that Han Solo has this buddy who bounces around from shady job to shady job, and when we realize that Han won the Falcon from this guy in a card game, we have some good reasons for believing in this universe. The first Star Wars presented itself as a story about a galaxy with a long history, and a ton of details in the movie supported that. There was a huge gulf between the mostly antiseptic Empire and its pristinely uniformed, British-accented officers and the DIY Rebel Alliance with its lazy American accents (we've all gotten the message, haven't we, that British accents are dignified and American accents are somehow inferior), its old, dirty fleet of fighters, and its closet of used, dinged up flightsuits and helmets. Just look at those helmets the next time you watch Star Wars. Besides looking like they actually belong to real pilots with real personalities, those things have been around the block. But even the Alliance looked classy compared to Han Solo and his "walking carpet" companion! ESB is in many ways a chance for Leigh Brackett, a writer of hard-boiled detective fiction as well as one member of the Holy Trinity who wrote The Big Sleep, and Lawrence Kasdan, the big softy who also wrote Raiders of the Lost Ark, Return of the Jedi, and The Big Chill, to take the dirtiness of this galaxy, the reality of it, and elaborate on that a bit. While a lot ends up happening in ESB, I would say that it often feels as if not much is happening at all. Most of the film's big events are crammed into fairly short sections at the beginning and end of the movie. But what happens in the middle is that our protagonists go in thematically as well as physically opposite directions. Luke heads off to Dagobah for some last minute Jedi lessons from Yoda, and in that sense, he's kind of headed in the brighter direction, the direction of personal enlightenment and growth. Leia, Han, Chewie, and Threepio get stuck just off Hoth when the Falcon decides not to let them jump to hyperspace and rendezvous with the fleet. In the interval, both they and the Empire end up consorting with representatives of the galaxy's criminal element in the hopes of achieving their ends. For Han, Leia, and company, that just means lying low long enough to get the Falcon fixed and then catch up to the rest of the fleet. For the Empire, that means capturing Han Solo to use as bait to catch the real prize, budding Jedi Luke Skywalker. Why the Emperor's now after Luke, I've never quite figured out. Sure, Vader realizes during the Death Star trench run in Star Wars that this pilot in front of him, whoever he is, is strong in the Force, but how must things have shaken out after that? Because it's a good distance from that sensation to the realization that there's this Skywalker kid out there. Was it that Vader eventually extrapolated from Obi-Wan's presence on the Death Star? But we now know that Vader never realized Natalie Portman survived to have the kids...? Anyway, it's a filmic sleight of hand that happens between the two movies that I can buy into in the moment, but I can't quite figure it out when I'm not watching the movie, though I love to speculate. Any ideas? Well, the important thing is, we see the Empire dabbling in some realpolitik. Here they collaborate with the galaxy's criminal underbelly, a consortium that must be a significant problem for the Empire, in order to catch Luke, who will presumably then become a powerful bulwark in the Imperial leadership. But think this through a little further, and it becomes really fun. The Empire is basically dealing with the same people who smuggle spice around under their noses, the very same people they were trying to prosecute back when Han Solo had to dump that load of spice at the last minute, the very same people the revenue from that spice was bound for, all in the hopes of catching the bigger fish. So Leia, Han, et al go off towards the darker end of the galaxy, into the less moral corners. Their quest, and the Empire's quest, is wholly one of convenience; Luke is off doing something spiritually and ideally fulfilling, while everyone else is embroiled in using means they can't really be sure are so safe, and this turns out to be the case for Han, to serve their particular ends. In the long run, it's the rebels who win, but not without the disaffected criminals who end up throwing in with them. Han deserves at least partial credit for wrecking the first Death Star, to say nothing of his role in the rescue of Princess Leia, and who blows up the second Death Star? Do you remember? Lando effing Calrissian, that's who. The source material for the first Star Wars is mostly Akira Kurosawa's The Hidden Fortress, an incredible movie about a general trying to transfer a princess and her devastated kingdom's remaining wealth to safer territory. The princess' success is brought about in part by the intervention of two clueless peasants who are, and I realize I'm fallaciously working backwards here, a cross between the bumbling droids and the self-interested mercenaries Han and Chewie. Just as a side note, I've often suspected that Chewie comes more from the general than from the peasants, just because there was I think a time when Chewbacca was the Ben Kenobi figure, huge and monstrous as well as wise and spiritual, but I could be overreading the general's imposing demeanor. He is played by the awesome and overwhelming Toshiro Mifune. Anyway, the point is that in Hidden Fortress the two peasants play that sort of mischievous role that's so essential in folklore and mythology (cf. Michael Chabon's introductory essay in Maps and Legends). Sometimes the mischievous peasant (or god or demon or whatever) gets killed horribly or screws up history for all of us (Norse myth), but HF is actually one of the other kinds of trickster story, the one where the tricksters help the good guys in spite of themselves. ESB, and to a greater extent the first Star Wars trilogy, presents a fictional universe that is so well developed that not only are we told and shown that these fringe elements exist, we are also made to believe they exist. They go about their own lives in the corners of the story, until all of a sudden they become part of the trilogy's momentous events. Which is really what Star Wars and all heroic myths are all about, anyway: the unimportant footnote-type people who grow into huge figures who shape history. That's exactly the way that ESB won my heart: it's almost a gaiden, a side-story, a tale that occurs kind of incidentally in the continuity but doesn't look like it should contribute all that much, but it ends up being sucked into the larger narrative, and this story that seemed not to have so much going for it ends up being a crucial chapter. For me, it's the crucial chapter. God, I love that movie. I would have to agree with you, both about Empire Strikes Back being a great movie, and about the final scene being the best scene in all of Star Wars. I also think that music from the final scene is a lot of the reason that ESB is my favorite film score, as well. And slightly off-topic (largely because I'm posting this comment two years after the blog post was written), but happy birthday ESB! 30 years and counting! I do like the music from that last scene. Something about that whole scene just makes me feel like I'm in the same boat emotionally as the characters--wondering what will happen next, wondering if there's any hope, wondering how the hell we could go from the happy ending of the first movie to this. It really pulls me in, somehow! And happy birthday ESB indeed!